I have been asked about strategies for teaching international students. In principle, the teaching should not be different, irrespective of whether we have students with English as Additional Language or only native speakers. We should continue focussing on group work and sharing experiences and thus building collaborative, reflective practices. So the strategies I am presenting here for teaching international students are merely a reminder of good teaching practice, as they will be beneficial for all students. Through showing them what it is we expect – in oral/presentational work or written essays – students get a better understanding of what they should be doing. Initially, they will copy or use the writing frames quite closely but over time they will internalise what is required and therefore develop independence. It is a good idea to slow down. When we know a topic well or are excited and enthusiastic about what we teach, then we tend to speed up, which makes it more difficult for students. Also, we should not underestimate the time students need to think their answers through. So having a minute of “silent thinking time” before we allow answers is a helpful strategy for all, but especially for those for whom English is not the native language. Graphs, diagrams and representations are helpful for students to grasp difficult concepts. If you are teaching difficult concepts, then it may be useful to highlight key terms early on in the course. If you can it would be great to have the glossary as a multilingual version, as this would also demonstrate the wealth and value of other languages in your classroom. When students talk with each other in group/pair work, we should not insist in English only. Once we ask them to feed back to the class they will have to do that in English, but allowing them to “think” in their native language provides opportunities for deepening thoughts. 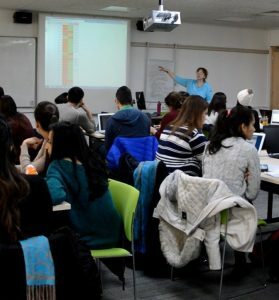 If you are using slides or videos for example, it would be beneficial for all students, but particularly those with English as Additional Language to be able to go through them before the actual lecture. Allowing students to pre-read the content means they are able to check out difficult words and add to the glossary of key terms. In the classroom, they will gain a deeper understanding, and therefore they will engage more actively, have more contributions to make and more interesting questions to ask. Through referring to their backgrounds, upbringing and educational contexts, we are able to make connections for them in relation to our contents, which in turn will help them understand concepts better at a deeper level. These tools will increase the engagement for all students, but international students with English as Additional Language have the opportunity to learn from their peers (pair work, group work) and demonstrate their understanding (clickers). Through the combination of these strategies as teachers we get to know their strengths and needs and can respond to those accordingly. At the end of the lessons ask students to record their reflections on learning. Allow them to record in any way that is convenient to them (mind map, essay, poem, drawings, graphs), but make sure they think about (1) what they learnt, (2) how they learnt, and (3) what they need to do next.